A woman weighs herself on a bathroom scale. 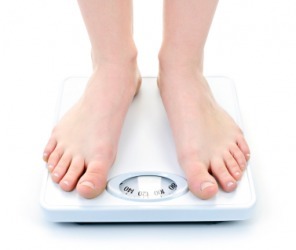 The definition of a scale is an outer protective layer made up of flat, rigid, overlapping plates. An example of scale is the skin of a fish. Scale is defined as a system or series of marks used for measuring or registering. An example of scale is what someone would use to figure out the length of something. An example of scale is what someone would use to find out how much they weigh. Scale means to climb up something or to remove in thin layers. An example of scale is rock climbing. An example of scale is to remove the outside layer of rigid, overlapping plates on a fish. "scale." YourDictionary, n.d. Web. 18 April 2019. <https://www.yourdictionary.com/Scale>. any thin, flaky or platelike layer or piece, as of dry skin, mail armor, etc. A small, thin, often flattened plant structure, such as one of the modified leaves that cover a tree bud or one of the structures that bear the reproductive organs on the cones of a conifer. To throw or propel (a thin flat object) through the air or along a surface, such as water or ice. A progressive classification, as of size, amount, importance, or rank: judging divers' performances on a scale of 1 to 10. A relative level or degree: entertained on a lavish scale. A minimum wage fixed by contract: musicians playing a benefit concert for scale. Mathematics A system of notation in which the values of numerical expressions are determined by their places relative to the chosen base of the system: the decimal scale. Music An ascending or descending collection of pitches proceeding by a specified scheme of intervals. To climb up or over; ascend: scaled the peak. To make in accord with a particular proportion or scale: Scale the model to be one tenth of actual size. To alter according to a standard or by degrees; adjust in calculated amounts: scaled down their demands; scaled back the scheduled pay increase. To estimate or measure the quantity of lumber in (logs or uncut trees). To rise in steps or stages. Middle English from Latin scālae ladder ; see skand- in Indo-European roots. An instrument or machine for weighing. Middle English bowl, balance from Old Norse skāl ; see skel-1 in Indo-European roots. One of the small thin plates forming the outer covering of fish, reptiles, and certain other animals. A small, thin, usually dry plant part, such as one of the protective leaves that cover a tree bud or one of the structures that contain the reproductive organs on the cones of a conifer. A plant disease caused by scale insects. An ordered numerical sequence used for measurement. A means of assigning a magnitude. A mathematical base for a numeral system. To change the size of something whilst maintaining proportion; especially to change a process in order to produce much larger amounts of the final product. To climb to the top of. To weigh, measure or grade according to a scale or system. From Latin scÄla, usually in plural scÄlae (“a flight of steps, stairs, staircase, ladder"), for *scadla, from scandÅ (“I climb"); see scan, ascend, descend, etc. To remove the scales of. To strip or clear of scale; to descale. (UK, Scotland, dialect) To scatter; to spread. From Middle English scale, from Old French escale, from Frankish or another Old High German source skala /scÄla. Cognate with Old English scealu (“shell, husk") (See shale and shell). compare French Ã©cale, Ã©caille, Italian scaglia. From Old Norse skÃ¡l (“bowl"). Compare Danish skÃ¥l (“bowl, cup"), Dutch schaal; German Schale; Old High German scÄla; Gothic skalja (skalja), Old English scealu (“cup; shell"). Cognate with scale, as in Etymology 2. (1) To resize a device, object or system. With regard to increases, "scale vertically" or "scale up" refers to expanding a single machine's capability. To "scale horizontally" or "scale out" refers to adding more machines. With regard to decreases, the term is often used with cutting-edge chip technologies. For example, "this memory scales with CMOS" means that the memory architecture takes advantage of the increasing miniaturization in CMOS chip fabrication by becoming smaller as well. See at scale, upconvert and scalable. One of the many small hard dermal or epidermal structures that characteristically form the external covering of fishes and reptiles and certain mammals, such as pangolins. A dry thin flake of epidermis shed from the skin. A skin lesion or lesions marked by such flakes. Dentistry To remove tartar from tooth surfaces with a pointed instrument.